Introduction by Carolyn Godschild Miller, Phd. Choosing a book on relationship is like trying to pick just one piece of chocolate from a tempting assortment. What you hope for is the literary equivalent of a delectable cherry, nut, or caramel. What you get is often a big disappointment. 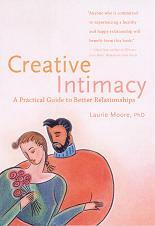 Creative Intimacy, however, is one guide to love youll devour with gusto! Its a thoroughly delicious read, and it packs the kind of intellectual and emotional nutrition a growing mind requires. Dr. Laurie Moore serves up an ingenious model for healing relationships by identifying what it is that we, and our romantic partners, truly need and want from each other. She describes 12 distinct Creative Personality Types, each of which relates to the world in a different way, and helps us identify our personal creative style, and that of our partner. She then shows how thorny interpersonal conflicts can often be quickly resolved when lovers call upon little-used aspects of their personalities to better meet each others needs and expectations. I especially like the way Creative Intimacy keeps the focus on self-knowledge, rather than self-improvement. Recognizing that if we knew better, we would do better, Moore provides a wealth of exercises designed to help us identify our true feelings and desires, and bring creative solutions into sharp focus. The process is brought to life by the intriguing stories of couples and individuals who tried her unique approach to conflict resolution and found that it worked! Dr. Laurie Moore makes a very compelling case for the idea that self-awareness, gratitude, and mutual understanding, can often resurrect the joyful intimacy in relationships that seemed destined for the scrap heap. If you are tired of simply giving up whenever a promising love affair bogs down in apparently irreconcilable differences, this book is for you. If you are willing to examine your own contribution to a painful romantic stalemate, but don't know how, this book is for you. If you deeply believe that love is meant to be easy, spontaneous, and fun but have never experienced it that way this book is definitely for you. Carolyn Godschild Miller, Ph.D., author of Soulmates: Following Inner Guidance to the Relationship of Your Dreams, and Creating Miracles: Understanding the Experience of Divine Intervention.